Cook beef in a large nonstick skillet over medium-high heat until browned; stir to crumble. Remove from pan; drain well. Add oil to pan. Add onion and garlic; sauté 3 minutes. Add bell peppers and carrot; sauté 3 minutes. Return beef to pan. Stir in raisins and remaining ingredients; bring to a boil. Reduce heat; simmer for 15 minutes, stirring occasionally. Discard bay leaves. 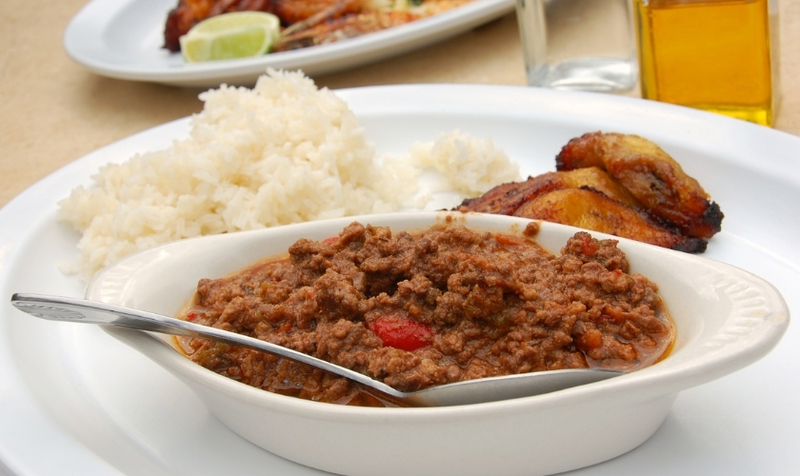 Note: Picadillo is a traditional dish in Spain and many Latin American countries and the Philippines (where it is known as giniling, and also Arroz a la Cubana) that is similar to hash. It is made with ground beef, tomatoes (tomato sauce may be used as a substitute), and other ingredients that vary by region. It is often served with rice or used as a filling in dishes such as tacos, savoury pastries or croquettes. The name comes from the Spanish word “picar,” which means “to mince” or “to chop”.